The bridge to Phoenix Park could soon be more ... illuminating. Image: Tina Ecker. The new year could bring beautiful new lighting to the pedestrian bridge that crosses the Chippewa River from Phoenix Park. 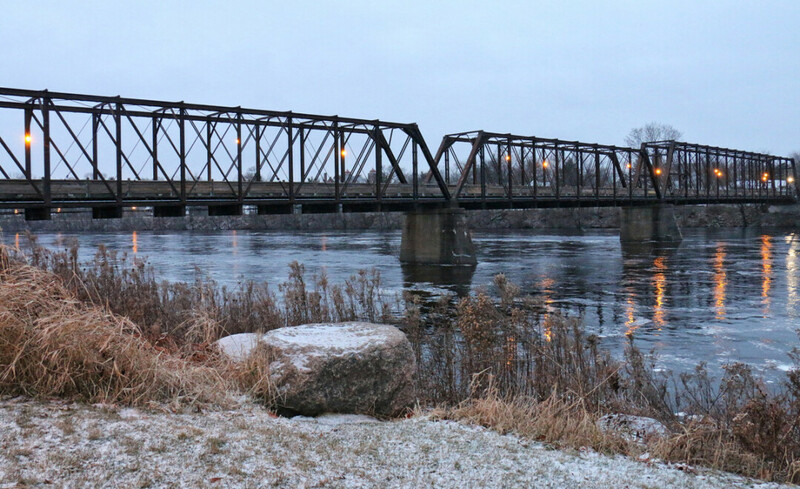 Downtown Eau Claire Inc. and the Eau Claire Noon Rotary Club are working together on plans to illuminate the bridge with programmable lights that could be used for special (or even everyday) occasions, says Mike Schatz, DECI executive director. For example, the lighting could be coordinate with the “Let It Glow” Christmas display in Phoenix Park or with July 4 celebrations, he says. The plan is in its earliest stages, Schatz says, and will be discussed by the DECI board of directors at a Jan. 6 meeting. The plan still must be approved by that board, as well as by the city Plan Commission, a step that could happen by February. If the necessary approvals are received, the lighting could be installed sometime in 2016, Schatz says. While the price tag of the project is unknown, Schatz says community donations will be sought; already, Northwestern Bank and Charter Bank have pledged $10,000 each toward the effort. Designs haven’t been finalized, but DECI has met with a provider of such lighting to study what’s been done in other cities. More detailed plans are expected to be made public during a kickoff for the bridge-lighting effort in late January.